Jonathan Dickinson was the leader of the little group that, in his words, “first concocted the plan and foundation of the College.” After graduating from the Collegiate School of Connecticut (later known as Yale University), Dickinson studied theology and became minister of the Presbyterian Church in Elizabeth, New Jersey. He served this church all his life, ministering to his flock as pastor, lawyer, physician, and, in later years, instructor of young men preparing for professional careers. 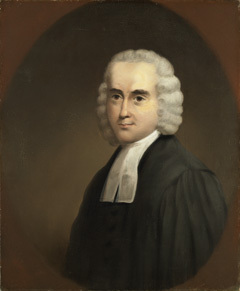 In 1739, Dickinson became one of the leaders of a movement to found a “seminary of learning” for the middle colonies. He was disappointed by Harvard’s and Yale’s opposition to the “New Lights” of the church and by Yale’s harsh treatment of his young friend, David Brainerd, a student who was dismissed because he gave outspoken opposition to the faculty’s conservative religious views. He considered the only other college in the colonies, William and Mary of Virginia, too Anglican and too far away. So, with the help of three fellow pastors (Ebenezer Pemberton, Aaron Burr Sr., and John Pierson) and three laymen from New York City (William Smith, Peter Van Brugh Livingston, and William Peartree Smith), he secured a royal charter for the College of New Jersey dated October 22, 1746. The first trustees announced Dickinson’s appointment as president in April 1747. Classes began the fourth week in May in Dickinson’s parsonage in Elizabeth, with approximately 10 students. The only decent library in town was Dickinson’s; his parlor was probably the classroom, and his dining room was probably the refectory. Dickinson died suddenly in October 1747 having served only five months as the College’s first president.